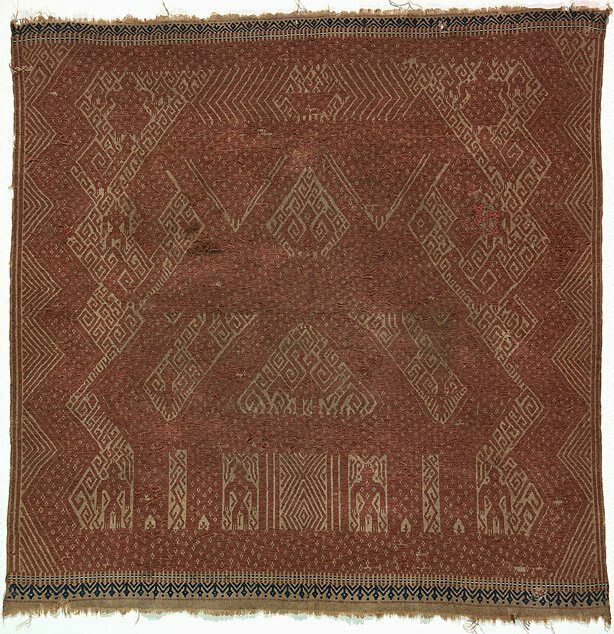 This tampan is typical of the central highland region of Komering because it has a large, bold design and narrow, simple borders. The motifs include the mirror images of a ship connected by a zig-zag line on each side of the central panel. The interior of the ship contains a large and elaborate building filled with figures, animals, and a mamuli-form (a semi-diamond shape with up-turned curves at the base that is common across the Indonesian islands). The figures probably represent ancestors. Mamuli are associated with fertility.